This article describes the model that I discussed in an earlier video (video link: https://youtu.be/Sx6YkT75ehg). Although a Gold Standard is not exactly a pressing topic for most of us, the simplicity of the system makes it easy to demonstrate ways in which we can use stock-flow consistent (SFC) models. In this case, I can explain why austerity was a core component of gold standard thinking. I described the operation of my model Gold Standard in an earlier article: Modelling a Gold Standard. I will not repeat the full description here, but I want to underline that this model gold standard does not match the various monetary systems that are often loosely called the "gold standard." The key difference with this scheme is that central banks always immediately cancel out net trade flows with gold flows. This is a much stricter scheme than was seen in the later variants of the gold standard; financial flows would normally balance out trade flows. 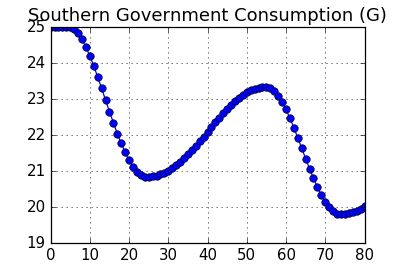 This model is based on model OPENG from Chapter 6 of Godley and Lavoie's Monetary Economics. I made some changes to how the governments operate, and so I believe that the dynamics look different. As in the book, the model is for two countries, labelled "North" and "South." The model starts out in a steady state with balanced trade flows, but after a few time periods, the South experiences a jump in the propensity to import. The chart at the top of this article shows the gold cover ratio for the South: what percentage of the money stock is covered by gold? It starts out at 40%, which is the target level for the government. Once the trade shock hits at time period 5, the gold cover starts to fall. This is because the South runs a trade deficit, and the central bank of the South has to sell gold to balance the foreign exchange market. The ratio later rebounds, and oscillates around the 40% mark. How was this achieved? 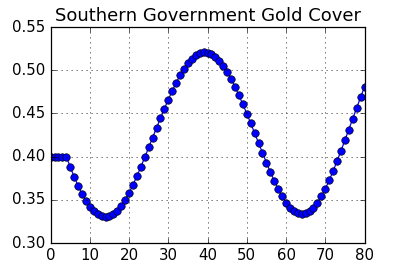 The chart above shows the policy lever moved to restore the gold cover. The Southern government cut back on spending; which is reducing "G" in economist parlance. Spending was steadily cut until about period 25, when it turned around. As we see, the spending is also oscillating, but it is on a downward trend. If we look at the time series data in detail (available if you run the example code included with the sfc_models package), we would realise that the cuts in government spending were too small to explain the improvement in the trade balance. Instead, the improvement in the trade balance was achieved by crushing the household sector. The chart above shows the after tax income (disposable income) for the Southern household sector. Over the entire time period, it fell from 100 to about 80, versus the much smaller decrease in government spending (25 to about 20). The situation in the North somewhat mirrors the situation in the South. 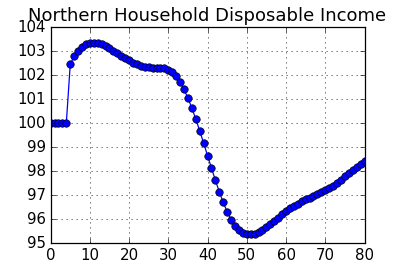 The figure above shows household disposable incomes in the North. Initially, the increased activity raises incomes in the North. However, once the austerity policy in the South improves the South's trade balance, the government of the North in turn has to implement austerity to improve its gold cover. We thus get the oscillating gold flows seen in the top chart. 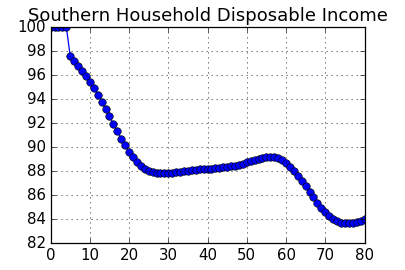 However, it should be noted that this is a negative sum game when looking at total incomes: both North and South households end up with disposable incomes below the starting level (100). The net result is that we see a back-and-forth game of beggar-thy-neighbour policies. However, we see that if policy makers care more about the gold cover than the welfare of their citizens, austerity policies achieved the objective of returning the gold cover ratio to target. A model with slow-moving oscillations in financial variables like the one discussed above is arguably unrealistic. More realistic behaviour would see capital flows act to speed up the adjustment process. We would be able to model this if we allow foreign sectors to own domestic financial assets. (This is a standard feature of academic SFC models; I have not implemented this in my Python framework yet.) This does not happen in the model above, as the gold flows exactly offset real trade flows, and so the net financial flows between the countries is zero. If we allow such cross-country holdings, gold flows would be supplemented or replaced by financial flows. As a result, there would be an additional policy lever within the model to balance the gold cover: interest rate policies. The central bank hikes rates, and draws in financial flows, which effectively brings in gold. Once we allow for these financial asset flows, it is not that difficult to extend towards models that resemble the operation of the euro area. Even if one objects to the mechanics of this model, it provides a useful teaching example. By running the example code (available online), it is possible to examine the interactions of all of the time series (and not just the few that I have highlighted here). Without seeing all the interactions, we are stuck with reading someone's interpretation of economic events. In this case, we could imagine someone describing the policies undertaken here as "governments tightening their belts," which does not sound too objectionable. When one realises that the actual driver of the policy is the massive contraction in private sector incomes, one looks at this "belt tightening" in a new light. I have largely finished all of the code that is going into "Version 1.0" of the library. I am now working on my book/report, which describes how to use the library. The target reader is someone who knows how to program, but is not necessarily an expert in Python, and more advanced concepts like object-oriented programming. The objective of the book is to explain how the library works at a high level, and the less familiar programming concepts it uses. My objective is to keep the book short (25,000 words or less). I hope to finish the first draft soon, but I expect that the earliest publishing date is September. Readers who are already familiar with advanced programming may be able to work directly with the documentation in the library. For such readers, the book will mainly be useful as a guide to the high level features of the library, which may not be apparent from just examining the code. Finally, for readers who are interested in SFC models, but not necessarily programming, the book will contain some discussions of how the models work, and what we can learn from them (like this article). That said, such readers will likely more interested in the following book, in which I discuss business cycle models in Python. That business cycle book will require adding in a lot of the features that are currently unsupported in the library.